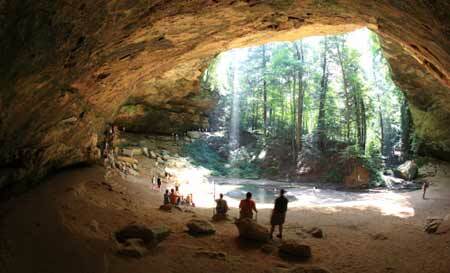 Ash Cave is the largest, most impressive recess cave in the state. It also handicap accessible. From the parking area, there is a concrete paved walk back to the cave area about 1/4 mile, with no climbing required unless you want to climb up to the rim. Ash Cave is really not what you would call a cave, other than there are ton's of rock that hang out above a visitor standing toward the base of the cliff. The horseshoe-shaped cave is massive; measuring 700' from end to end, 100' deep from the rear cave wall to its front edge with the rim rising 90' high. A small tributary of the east fork of Queer Creek cascades over the rim into a small plunge pool below. Ash Cave was formed like the others in this region; the middle layer of the Blackhand sandstone has been weathered or eroded while the more resistant upper and lower zones remained intact. 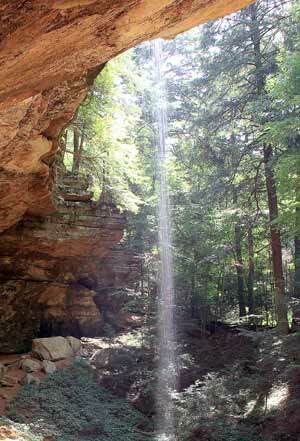 Ash Cave got its name because early settlers found a large pile of ashes under the shelter. The largest pile was recorded as being 100' long, 30' wide and 3' deep. The source of the ashes is unknown but is believed to be from Native American campfires built up over 100s of years. Another belief is that the Indians were smelting silver or lead from the rocks. Still another theory claims that saltpeter was made in the cave which was used a meat preservative. Whatever the source, several thousand bushels of ashes were found. A test excavation of the ashes in 1877 revealed sticks, arrows, stalks of coarse grasses, a large number of animal bones, bits of broken pottery, flints and corn cobs. Later excavations of the area found that elk and black bear were also prevalent in the area. Because of the unusual acoustics created in the gorge, Ash Cave became the site for a variety of public meetings and gatherings held in the area in the late 1800s. By 1900, most of the old hemlocks had been cut down. The bark of the hemlock, is high in tannic acid and was used for tanning leather. 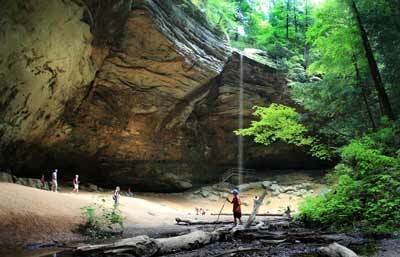 In my opinion, Ash Cave is the most dramatic of all the Hocking Hills State Parks. It offers a pleasant walk without having to climb, yet if you wish to do some climbing, there's plenty of opportunities.